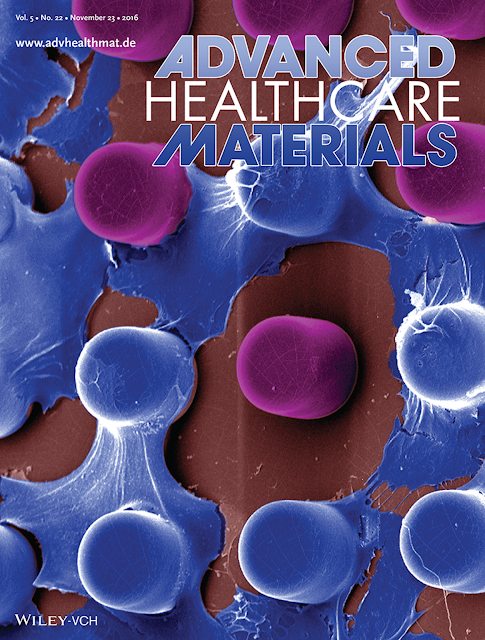 Our recent research article on development of corneal endothleial cell therapy is selected as back cover in the latest issue of "Advanced Healthcare Materials"
Our recent research article "In-vitro Topographical Model of Fuchs Dystrophy for Evaluation of Corneal Endothelial Cell Monolayer Formation" appeared on the Back cover of Advanced Healthcare Materials latest issue. Several diseases have been known to be caused by microstructural changes in the extracellular microenvironment. Therefore, the knowledge of the interaction of cells with the altered extracellular micro-structures or surface topography is critical to develop a better understanding of the disease for therapeutic development. One such disease is Fuchs corneal endothelial dystrophy (FED). FED is the primary disease and major reason of corneal endothelial cell death. If left untreated, corneal blindness will be resulted; thus, FED is the leading indication for corneal transplantation. In the USA, 4% of population over the age of 40 is believed to have compromised corneal endothelium due to FED, which will further increase due to increasing life expectancy and rapidly ageing population. A diagnostic clinical hallmark of FED is the development of discrete pillar or dome-like microstructures on the corneal endothelial basement membrane (Descemet membrane). These microstructures are called corneal guttata or guttae. Cell therapies have been proposed as an alternative treatment method for Fuchs dystrophy patients. However, currently, no in-vitro or in-vivo FED disease model is available to study the cell therapies before clinical trials. In this study, the pathological changes in the micro-structure of basement membranes resulting from FED disease was analyzed, to identify geometrical dimension to develop an in-vitro disease model of synthetic corneal guttata pillars/domes by using microfabrication techniques. This model was used to study the monolayer formation of donor-derived human corneal endothelial cells to test the effectiveness of the corneal endothelial cell regenerative therapies. The results suggest that the corneal cell therapies may not be equally effective for patients at different stages of disease progression. The pre-existing guttata in patients could interfere with the cells thus hampering monolayer formation within the eye. Surgical removal of the guttata from the diseased Descemet membrane prior to cell regenerative therapy could increase the success rate of monolayer formation, which could potentially increase the chances of cell therapy success. This study also demonstrate how biomaterial design can be employed to mimic the pathological microstructural changes in basement membranes for better understanding of cellular responses in disease conditions.